There’s an M&M reference in the new play at the La Jolla Playhouse — about the candy, and the rapper, Eminem. That’s an apt metaphor for “The Year to Come.” It’s pretty sugary on the surface, but there’s a nut of truth and wisdom deep inside. It takes a while to get there, though. The world premiere starts off like a sitcom, a family gathering filled with snarky one-liners. It’s a contentious, dysfunctional family (is there any other kind onstage? ), with secrets that don’t get fully revealed until the entire story unwinds, moving backward in time, over the course of 2½ hours. The reverse-time conceit (New Years Eves from 2018 to 2000, in Florida and New York) seems a little gimmicky at times, and some of the reveals are predictable. The source of so much angst takes too long to get to, and isn’t really revelatory, as much as filling in details about what we already suspected. Playwright Lindsey Ferrentino has a quirky sense of humor and a terrific ear for dialogue that pops and crackles. Director Anne Kauffman, an MFA alumna of UC San Diego, keeps the pace and timing lively and sprightly. No part of the show actually lags, but the sum total feels over-long. The irony is that, for all the talk of change and the future, the structure — and the family obsession — is all about the past. Subterfuge and delusion are most prominent in the Cuban father, Frank, a stereotypically gruff, racist, right-wing fireman (wonderfully played by Jonathan Nichols) and his gay son, Jim (excellent Adam Chanler-Berat), and his husband, Sinan (terrifically droll and endlessly, amazingly tolerant Pomme Koch). 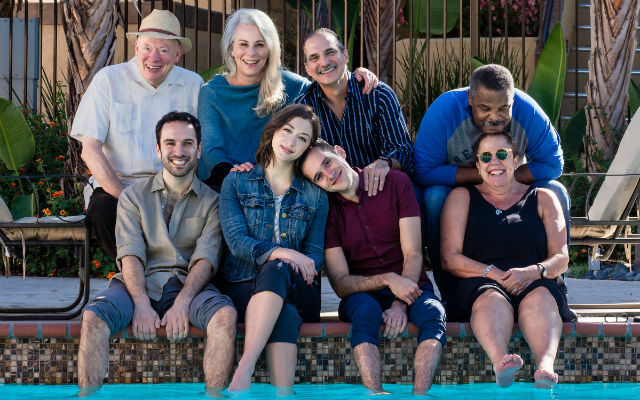 The whole play is showing how this family got to where they are when we first meet them — a diverse, blended but disparate bunch trying to make the best of their lives, desperately attempting to look ahead to a future of positive change (they repeatedly tell themselves and each other that “change is good,” but we don’t believe it for a minute. Two of the other characters are a little more complex and multi-faceted. Peter Van Wagner springs from vegetable to rocker, doing a knockout, guitar-playing version of “Viva Las Vegas,” as well as spewing forth a terrific monologue. Ray Anthony Thomas plays an (unfunny) standup comedian wannabe. Jenna Dio Guardi makes the most of a small but significant role. The production design is superb. Christopher Acebo, another UC San Diego MFA alum, has created a magnificent set, with a functional, 2000 gallon swimming pool downstage, above the orchestra pit. Beautiful skylight windows let snow fall in and vultures drop from the sky (pretty heavy-handed and unlikely). The Florida patio transforms magically to a New York home. The lighting (Lap Chi Chu), sound (Brandon Walcott), costumes (Dedxe Ayite), video design (Anna Robinson, who provides a walk down the country’s memory lane, with all its good and ills, of the past 18 years all contribute mightily to creating a rich context for the familial struggles to play out. It’s a strong production for a new work, but the play needs tightening and a stronger focus on the deeper, more serious themes rather than its easy-laugh, superficial ones. Performances are Tuesday and Wednesday at 7:30 p.m., Thursday-Saturday at 8 p.m., Sunday at 7 p.m., with matinees Saturday and Sunday at 2 p.m.